Today's in parliament M.E. * is being debated finally after 20 years (the last debate was in 1999). Stop GET (Graded Exercise Therapy) & CBT (Cognitive Behavioural Therapy) - it doesn't work. NICE* guidelines need to change. Give people with M.E. (/CFS*) equal access to care wherever they live - no more 'postcode lottery' and increase specialist rehab centres. In the UK 250,000 people have M.E/CFS; 1 in 4 people are severely affected, thats 62,500 people if you put that in numbers. For to long M.E. suffers are left alone in silence. We want to contribute and be part of society; not hidden away. We deserve better. Stephen Pound MP gave a really good contribute to today's debate. Thank you to all the MP's that went along to the debate today. Hopefully change will happen. Watching the debate was very moving. 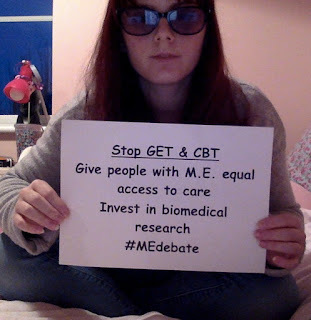 Seeing such support for people like me and hearing that parliaments agrees that GET and CBT do more harm than good and that more biomedical research is needed and that M.E/CFS needs to be seen and treated and a physiological condition. That care professionals need to change their attitudes and that areas such as education, work, DWP and housing also need addressing. MP's also read out case studies from constituents in their area with M.E. 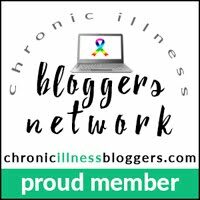 and hearing their stories made me feel like I wasn't alone in my struggle with the condition. To follow and find out more about the date search #MEdebate on Twitter. The full debate can be found on Youtube here. I also wanted to highlight how the PACE trial contributed towards the NICE guidelines developing the GET and CBT care for people with M.E/CFS. The PACE trial was deeply flawed and the results altered to make it look like GET and CBT worked for people with M.E/CFS. My favourite YouTuber Jessica Kellgren-Fozard makes a great video examining what is the PACE trial and how misleading it was.